I'll be the first to admit that I drink a lot of coffee! (Not to mention hot tea and sweet tea!) I'll also readily admit, that's probably not going to change anytime soon! While my drinking habits give me a boost throughout the day, they don't do much to boost the brilliance and white of my teeth. 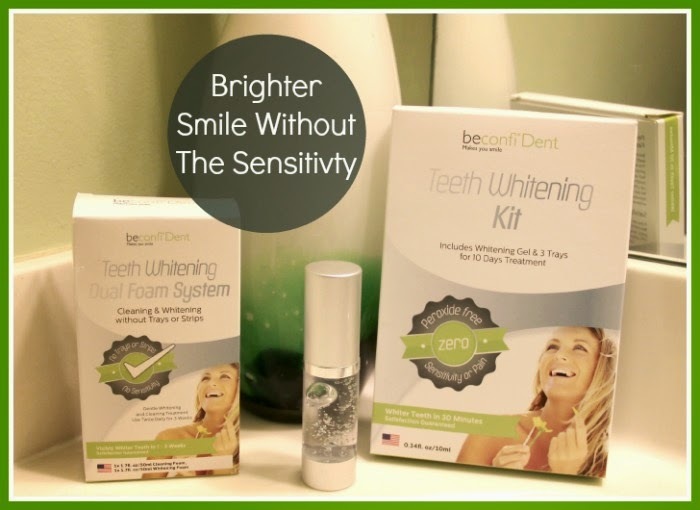 BeconfiDent sent me several of their Teeth Whitening Kits, Systems, and products (pictured above), at no cost to facilitate this review, and I was excited to gain some confidence in my new whiter smile! 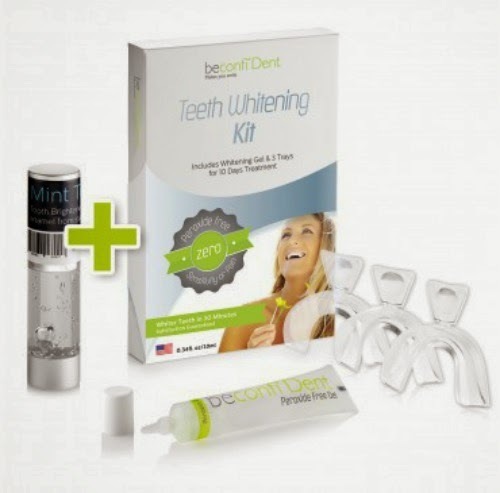 Discover the BeconfiDent Teeth Whitening Kit that will give you a visibly whiter smile, which is sure to boost your self confidence! Why pay for an expensive professional whitening treatment when you can do it at home for a lot less? Our fast acting, peroxide free whitening treatment is the best choice to achieve that brilliant smile. 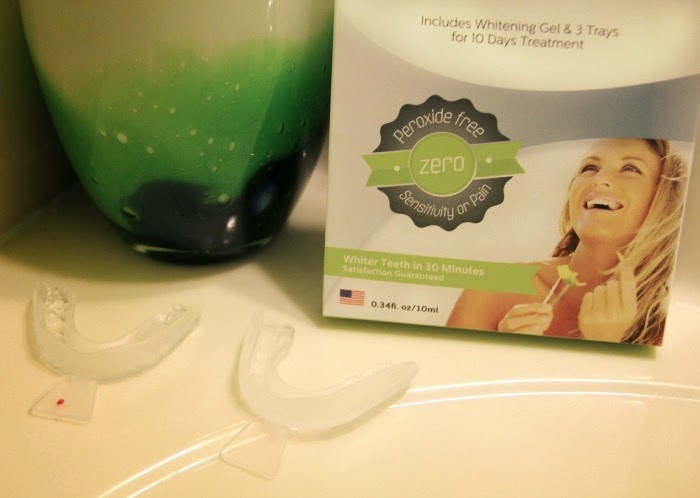 I started off my teeth whitening adventure with the Teeth Whitening Kit, which included the beconfiDent peroxide free whitening gel, three teeth trays, and as a bonus, Mint Teeth Gloss. 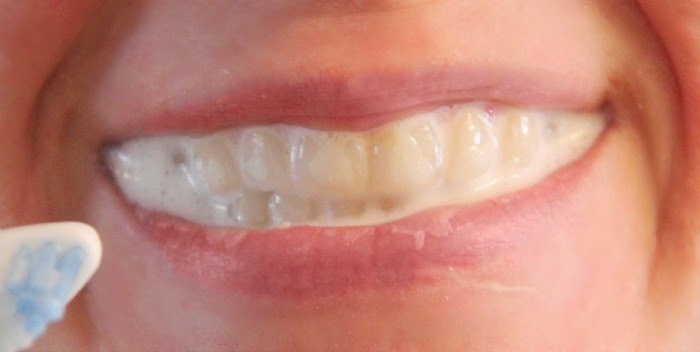 To properly use the teeth trays, you first need to boil them for a few seconds then bite into them in order to get a proper fit. I repeated this process twice, just to ensure I had the best fit possible. A thin layer of gel is placed on the inside of each tray and then placed in your mouth for 15 minutes. You may notice a small red dot on the tray to the left. Being a busy Mom, I like to make things as easy as possible and I knew I'd forget which tray fit the top teeth and which fit the bottom. I used a permanent marker and just made a small dot on the top tray - which made it much easier to remember the correct placement. 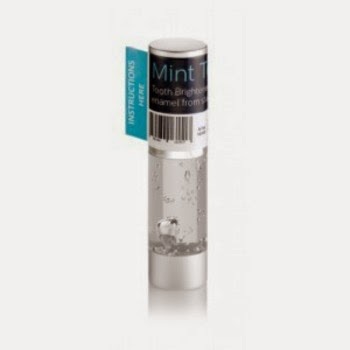 When it comes to the Mint Tooth Gloss, all I can say is I'm totally in love with this product! The mint is absolutely refreshing, but my favorite part is that this gloss actually helps to prevent stains from my coffee and tea from setting in to my teeth. Most whitening products out there only work after the damage has been done, but this product actually helps keep my smile protected - and that means I can drink my favorite beverages without the guilt of hurting my pearly whites! Stands easily at the bathroom sink, but small and sophisticated enough to throw it in my purse for some on the go extra blast of white. Overall the Teeth Whitening Kit proved pretty easy. I liked that I could whiten both top and bottom at the same time and that it only took 15 minutes. I'm not sure if it's the way that my mouth is shaped, or if it's because I endured years of orthodontist work, but I did have a slight issue with drooling while the trays were in place. I grabbed a paper towel to keep on hand and my 15 minutes were up in no time. I noticed an immediate chance in the shade of white, and was excited to try out the next product for a more confident smile! 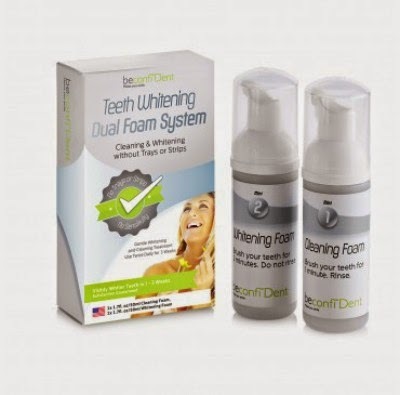 Though both systems worked quite effectively, and the Teeth Whitening Kit with the trays whitens faster, this Dual Foam System was my favorite of the two. Only three minutes a day for whiter teeth? How could you not love it! Unlike whitening strips or trays, the Dual Foam System allows me to use my own toothbrush, to brush the tops, sides, and in between all of the space in and around my teeth - giving me an over all whitening experience. I love that with this system, I can make sure every part of my teeth are treated with the whitening treatment. Not only is the surface of teeth being whitened, but the Dual Foam actually penetrates deep, set-in stains below the surface for an even deeper white! 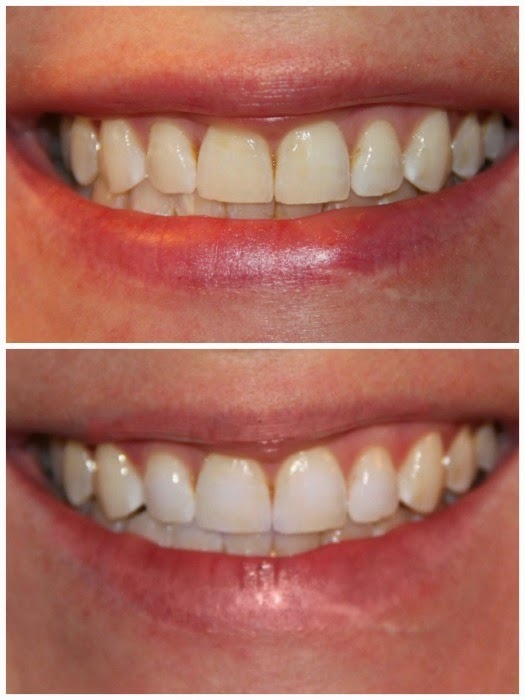 Top photo - the 'Before" Bottom photo - the "After"
Keep in mind, when using beconfiDent, make sure to use the product for the time suggested to achieve maximum whitening results! No matter if you choose to whiten with the Teeth Whitening Kit or with the Dual Foam System, one of the greatest benefits is that all of the beconfiDent products are peroxide free! In all of my usage of both systems over the course of two weeks I never had any pain or sensitivity. If you are looking for the perfect alternative to the typical whitening that involves peroxide and other chemicals, you have found the answer, and a brighter, whiter, more confident smile in beconfiDent! Check out the beconfiDent website HERE to see all of their amazing products! Don't forget to follow beconfiDent on social media to hear about upcoming promotions and new products! One lucky reader will win their own beconfiDent Dual Foam System PLUS Tooth Gloss. A prize package worth $80! The giveaway will end May 8, 2015 at 11:59pm. Open to residents of the US only and must be 18 years old to enter. Enter using the Giveaway Tools entry form below. Disclosure: I was sent the items listed above at no cost to facilitate this review. Prize fulfillment is the responsibility of beconfiDent and not Our Southern Style. This giveaway is not associated with Facebook, Twitter, Instagram, or Pinterest. Want to get more reviews, recipes, giveaways and more? Make sure to follow Our Southern Style on social media! Spring is here and Summer is on it's way! One of my favorite parts of these seasons is the switch from jeans, sweaters, and scarves to bright colors, sun dresses, and of course, lots of sparkle! I've had the opportunity to share several other Touchstone Crystal pieces with you before and I'm so excited that Touchstone Crystal gave me another opportunity to share with you the pieces pictured above, which were sent to me at no cost to facilitate this review, along with their new online catalog and website, and a Touchstone Crystal Fashion Spread to show you how to create some this spring and summer's hottest looks! Swarovski has long been known to shine on the red carpet, and this Spring, Touchstone Crystal brings all of the glamour of Hollywood to everyday women with new jewels that premier fabulous colors, vibrant crystal cuts, and new designs to celebrate everything we love about spring and summer. With so many new pieces, to fit every style and budget, there's something for everyone in Touchstone Crystal's new online catalog to make every lady's spring sparkle. Click HERE to check out Touchstone Crystal's new online catalog. It's okay.You can say it! That is one stunning necklace! No picture of this Sea Glass Necklace could ever do justice to the breathtaking beauty of this piece. Both of my daughter's were with me when I took this stunner out of it's box, and both gasped at the same time, "Mom, are those real?!" Yes, those are definitely real Swarovski Crystals! If you are looking for a statement piece this Spring, order the Sea Glass Necklace and let it to all of the talking for you! It's impossible not to notice the bright, bold colors and the precision cuts of each crystal that allow each perfectly placed gem to sparkle with every movement. Jazz up one of your favorite outfits, or just let this necklace be the star of a more simple ensemble. There are so many ways to wear this necklace, each way making you feel like a star! You can order the Sea Glass Necklace HERE from Touchstone Crystal for $149.00. These adorable earrings add the perfect playful touch to any summer's outfit. Simple in their design, they add just the right amount of gold and shimmer and are an excellent addition to just about every casual look. I"m so excited for the hot temperatures of summer so I can pair these earrings with some jean Capri pants and a tank top. With over 20 Swarovski Crystals nestled into each Golden Sea Star earring, light from the summer's sun is sure to catch from every angle! I love to get dressed up every now and then, but I live in my jeans and T-Shirt, and because these earrings go with just about every causal outfit I own, they are going to be spending a lot of time adding sparkle to my outfit this summer! You can order your own pair of Golden Sea Star Earrings HERE from Touchstone Crystal for $49.00. Even if you don't live by the ocean, you'll feel like you belong at the beach every time you wear this shimmering Sand Dollar Pendant. Perfect for an evening on the boardwalk, or just a night out on the town, this pendant hangs on thin chains which really makes the pendant the star of this piece. This silver Sand Dollar is elegantly framed in Aquamarine and Azore crystals bringing even more brilliance to an already captivating necklace. Every Touchstone Crystal piece is exclusively made with Swarovski crystals and zirconia, designed using unique Swarovski innovations, cuts, and trend colors. Touchstone is proud to carry a product line with looks for every woman at every price. The best part is, half of our line is under $50 making glamour affordable for women everywhere. - Touchstone Crystal. Click HERE to check out their line of gorgeous jewels, all under $50! There is not a piece yet from Touchstone Crystal that I haven't loved! No matter the outfit, Touchstone has something to enhance my look and make my Spring and Summer wardrobe sparkle! I may not have a a lot of money to spend on a wardrobe and accessories every year - but will Touchstone Crystal - I look and feel like a million bucks! How could you not with all that sparkle!? As always, Touchstone Crystal is always looking for those interested in becoming a Consultant so if you are looking for another way to earn a little extra income, or just some spending money? Check out Touchstone Crystal’s Consulting program HERE. Don’t forget to follow Touchstone Crystal on all of their social media pages so you never miss a chance to add some sparkle to your life! Check out all of Our Southern Style's other Touchstone Crystal reviews! Touchstone Crystal ICE Bracelets - Perfect for Mother's Day! This year, my husband, Ben, and I were looking for a way to celebrate each other for all of our hard work throughout the year as parents of our four kids. Mother's Day and Father's Day usually arrives quicker than we realized and with our big family we never seem to have time to plan much more than a meal out to eat together as a family (and hey, as a Mom who primarily cooks all the meals, I'm not complaining!). I was thrilled when JORD allowed me to review two of their unique wood watches (pictured above), at no cost to facilitate this review, because this was something both my husband and I could appreciate not only for Mother's Day and Father's Day, but all year around. Though we give up a lot for our children in the way of time, and material things, it's important every now and then to find a way to commend each other on a job well done - and JORD helped us do just that! Disclosure: I was sent the item above at no cost, to facilitate this review. If you have ever walked down the doll isle at your local store, you will find any doll that does just about anything. They have dolls that wear make-up, dolls that can become mermaids, dolls that are veterinarians, the list goes on and on. I was so excited when MGA Entertainment sent me a Moxie Girlz Knitting Fun doll to review because I knew it would be something both my girls would have fun with, but also something that would keep their attention and keep them moving on a project for longer than just a few minutes. My girls are always ready for some extra creative fun, and over the weekend we decided to bust our Moxie Girlz Knitting Fun girl, Avery, out of her box and see just what she was made of. Pamper Mom This Mother's Day With Lemongrass Spa! Moms come in all shapes and sizes. They all have different likes, dislikes. There's stay-at-home Mom's, working Moms, single Mom's, the list of descriptions could go on and on. No matter the Mother, there's one word that fits all Moms and that's busy! With so many things to do everyday, from work, the kids, cooking, cleaning, laundry, homework, church, the family taxi, it's hard for most Mom's to take time for themselves. Rhonda B., from Lemongrass Spa provided, at no cost to facilitate this review, the Loving Care Gift Set to give this tired Mom a little pampering and I can't wait to share these great products AND A LOVING CARE GIFT SET GIVEAWAY! with my readers! Gun ownership has long been a hot topic in the media and will probably continue to be. I could dedicate this entire post on why I believe it is entirely within my rights (both constitutional and humanly speaking), to own a gun, and to keep it for the protection of myself and the family that God has placed me responsible for, but I would rather dedicate this post to something I think most all of us can agree on, and that is, if you own a gun, and you keep it loaded for protection, you should keep it locked up and out of the reach of hands that might attempt to use it, whether out of curiosity, or like some of the most extreme cases seen in the news, out of the reach of hands that might seek to use it for harmful and tragic purposes. DCG Stores recently sent me their MiniVault Biometric GVB-1000 Gun Vault (pictured above), at no cost to facilitate this review, and I have found it to be the perfect gun vault for both my modest family budget and it's ultimate purpose, keeping my gun safe, so I can keep my family safe. For over 3 1/2 years during our marriage, my husband, due to family matters, had to travel back and forth to Michigan twice every month. At first, I didn't feel too alarmed about being alone, after all, I used to live in Minneapolis, where police sirens were just part of the regular outside noise, and now I lived in a townhouse in West Virginia where most of the noise I heard when I opened my windows was birds chirping or kids playing. My husband would take our youngest daughter, Eva, with him so she could visit family and I really only had myself and the dog to worry about. One afternoon, during the regular week, I was pregnant with our 3rd child, Elijah, when our dog started growling and barking at our back door that overlooked our 2nd story deck. I went to investigate just in time to see a man dart through our neighbors back door, hop over the railing to my deck, and drop down 7 feet to the ground below. Fifteen minutes later, the police were at my neighbor's (a single mother) door and I soon discovered a man, had broken into her home through her basement window but her teenage son was home alone and he startled the intruder. Thankfully the man did not attempt to harm her son and instead, escaped out her back door and over my deck. But my reality of living in a perfectly safe neighborhood and the notion that "it could never happen to me" was shattered. Shortly after this incident, my husband and I had the discussion that we should have had a long time ago, about what I would do in the event I was faced with an armed intruder in our home, especially if he was away and it was just me and the kids. Now, I'll admit, I'm a pretty feisty gal, and I'm sure every bit of "Mama Bear" instinct would jump out should someone ever attempt to harm one of my kids, but realistically, my petite, 5 ft 1" frame would have a hard time fighting someone off on my own...and 15 minutes in a case like this... is a long time to wait for help to arrive. We made the choice to purchase a handgun and I completed a course on firearm safety, shooting accuracy, and using my firearm as a last resort. The BioMetric GVB-1000 comes with two ways to power the vault. You can either plug it in using the 2-pronged power adapter, or install a 9v battery underneath the layer of ceiling foam. Because I keep my handgun safe in my bedroom closet, I choose to use a 9v battery (which means I can put my vault anywhere). Using the instruction booklet, I was able to easily install the battery and tuck it back into the ceiling of the vault, and power up my vault. It is important to note that GunVault still recommends using the 9v battery even if using the AD/DC power supply to prevent interruption of power and loss of access and codes. When I first read over the manual to set up access to my vault I had a bit of trouble (come to find out, I was reading the set up for the wrong vault) It's seems like stating the obvious, but in my excitement to get started I didn't read it through the entire way. Once I found the write model, set up was extremely easy! Each unit also comes with a set of keys (2 keys per unit) and its important to store them some place safe (not inside the vault) just as a back up to getting into the safe. The unit comes in "DEMO" mode. To enroll the first fingerprint, simply press the S1 button which will cause the door to spring open. Hold the button until the unit beeps twice and then place the index finger on the Fingerprint Reader, and finally press the S1 button to activate the module, and hold the finger in place until the green light is on (takes just a second or two). Up to 15 users can be enrolled to have access to the vault, with the first two prints being used as "administrators". After I enrolled my fingerprint, I practiced opening my vault multiple times. It is easy for me to gain access within seconds by placing my index finger in the reader, pressing the S1 button and holding it in place till the red light turns green. The fingerprint function is probably my favorite feature about this vault. The other buttons on this vault act as "decoy" buttons. No matter what buttons are pressed, or what order they are pressed in, the only way this vault will open is with the fingerprint of the person who has access to it. Should I need to delete the fingerprints, the vault allows me to do so with just a few simple steps. The MiniVault Biometric GVB-1000 vault is big enough to hold my 9mm handgun and magazine comfortably and still has enough room for a second magazine, or a small flashlight. I also store an extra 9v battery in the back of my vault. As I stated earlier, I've practiced opening my vault several times and even walked through the steps at night, in the dark. Each time the vault opened within seconds and in the dark, I'm still able to see both my handgun and magazine because of the Interior Courtesy Light found on the inside right ceiling and is activated for about 5 seconds after the door is opened. Whether you agree with the 2nd Amendment or whether you believe all guns should be outlawed, I'm glad that I live in a country that gives me the right to protect myself and my family from individuals who have no regard for right and wrong and came to my home with the intent of breaking the law in the first place. You might not agree with our countries gun laws, but I hope you can agree the best place for a loaded gun in in a gun vault or safe and without a doubt, the MiniVault Biometric GVB-1000 is one of the best on the market. Need to secure your handguns in a safer place? This MiniVault Biometric GVB-1000 vault is valued at $426.00 but right now, is on sale HERE at DCG Stores for $259.95 with FREE SHIPPING. Think gun vaults is all you'll find at DCG Stores? Think again! Visit their website HERE for all of your home needs - "Shop Smart, Save More"! Follow DCG Stores on social media to hear about all of their latest promotions and products! 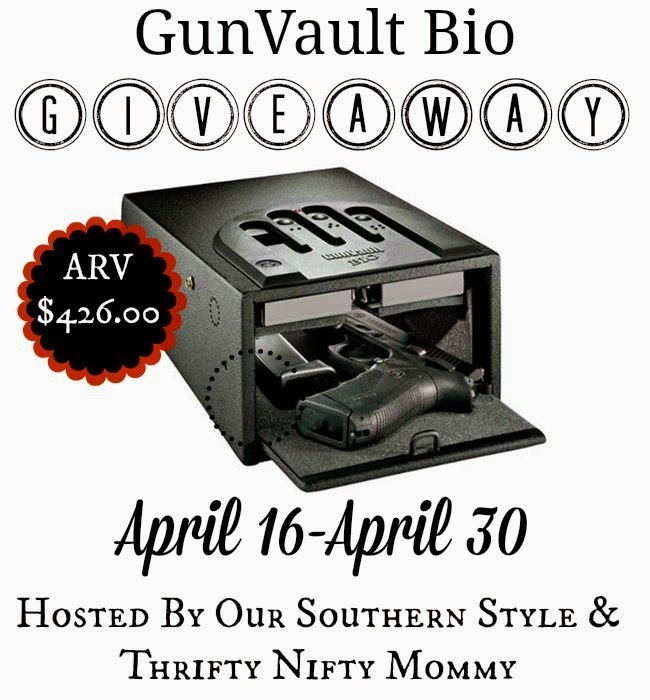 ONE lucky reader will win their own MiniVault BioMetric GVB-1ooo . The giveaway will end April 30, 2015 at 11:59pm. Open to residents of the US only and must be 18 years old to enter. Enter using the Giveaway Tools entry form below. Disclosure: I was sent the items listed above at no cost to facilitate this review. Prize fulfillment is the responsibility of DCG Stores and not Our Southern Style or Thrifty Nifty Mommy. This giveaway is not associated with Facebook, Twitter, Instagram, or Pinterest. Follow Our Southern Style on social media for more reviews, giveaways, recipes, and MORE! There's no movie more popular in our house right now than Disney's Big Hero 6! All four of my kids love this movie but my two boys, Elijah and Levi can't seem to get enough of of their new favorite heroes! 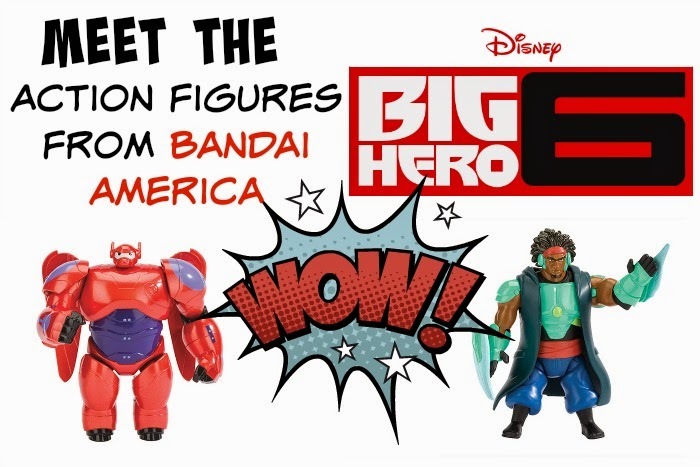 Bandai America has so many new Big Hero 6 toys available and they were kind enough to send me their new 6" action figures (Baymax and Wasabi pictured above), at no cost to facilitate this review. From the moment they arrived in the mail Baymax and Wasabi have been joining Elijah and Levi on adventure after adventure and it doesn't look like the fun will be ending any time soon! I love my Mom! There are so many wonderful things about her that I look forward to celebrating every year on Mother's Day. As a single Mom, she worked harder than most each and every day to make sure I and my brother and sisters had not just the material things we needed, but that we had all of her love and support to chase our dreams and goals in life. Now being a Mom myself, I appreciate all the more the sacrifices she made each and every day. Not long ago I worked with Touchstone Crystal on a recent review and was so excited when they offered to include me (and my Mom) in a special review of the crystal bracelets from their ICE collection. They sent me the bracelets (pictured above) at no cost to facilitate this review. Disclosure: I received the item above at no cost to facilitate this review. Teen Titans fans can relive the latest adventures when Warner Bros. Home Entertainment releases Teen Titans Go! : Appetite For Disruption Season 2 Part 1. on DVD April 14, 2015. The two-disc DVD set is priced to own for $19.97 SRP and features over 4 Hours of content on 2 DVD discs! Teen Titans Go!, which consistently raked as the #1 show for kids 6-11 on Cartoon Network has been renewed for a third season of fun and mayhem. It's Not Easter Without Peeps! Disclosure: I received the items above at no cost to facilitate this post. Even as an adult, with kids of my own, I still indulge my inner child with a box of Peeps every Easter. Growing up, Peeps were always my favorite surprise in my Easter basket, and I still have to have a pack every year. When I was a kid, there was pretty much just your basic colors of yellow and pink Peeps combined with that sugary, marshmallow flavor we have all come to know and love. The traditional Peeps Marshmallow Chicks have been a fan favorite for more than 60 years! Now the world of Peeps is so much larger and full of new flavors and shapes and I'm so excited to share with you the newest edition to the Peeps family! Say hello to Peeps Decorated Eggs! The perfect addition to your child's Easter basket this year, these marshmallow eggs come as nine white eggs iced with pastel colors in three unique designs. I've never personally tried frosted and iced Peeps but I'm excited to add these to my Peeps Easter tradition! The pastel colors and the affordable price of $1.49-$1.79 means they will add excitement to all of my children's baskets, both boys and girls! My kids love the Blue Raspberry flavor and we decided to try our hand at our own recipe that highlighted the fun of Peeps! I love the simple delicate flavors of shortbread cookies and wanted to bring in the blueberry so I came up with a new recipe for Blueberry Shortbread Cupcakes with Vanilla Butter Cream Frosting and then decorated them with Chocolate Coconut Nests that I filled with a Peeps Blue Raspberry Chick and fresh berries. They turned out so cute for Easter and my family couldn't wait to dive into these fun cupcakes! No matter what you fill your kids Easter baskets with this year, remember, it's just not Easter without the long-standing tradition of Peeps! With so many different flavors and varieties , you are sure to find the perfect Peep for every Easter basket! Visit the official Peeps website HERE to check out all of the flavors, varieties, as well as recipes and craft ideas! Follow Peeps on social media and be the first to hear about new recipes, products, and promotions! Visit Our Southern Style for more reviews, giveaways, and recipes! I love baking cupcakes! They are so much fun to make and even more fun to eat! With Spring time finally here, I wanted to bring in some of my favorite flavors and blueberry is definitely one of them! I will be the first to admit, I don't like super sweet cupcakes. I'm always the one wiping off the frosting from my cupcake (unless its made with chocolate or cream cheese). I've always loved the simple flavors of shortbread cookies and I wanted to bring the same taste to some delicious cupcakes. Since Easter is just around the corner - I decided to decorate these adorable cupcakes with a chocolate coconut nest filled with berries and a Blue Raspberry Peep. It's just not Easter without Peeps! You can certainly make these cupcakes and enjoy them without the toppings, or make the nests and fill them with your own creative ideas! As always, the best cupcakes are made with ingredients that have been set out to room temperature! 1. Preheat oven to 350 degrees. Cream the butter and the sugar until light and fluffy. Add the egg yolks one at a time until combined. Mix in vanilla. 2. Sift the flour and the baking soda. Add half of the flour mixture to the wet mixture. Add the sour cream. Finally add the rest of the flour mixture and stir until combined. Finish by adding the blueberries, stirring until combined. 3. Fill cupcake pans 2/3 full of badder and bake at 350 degrees for 20-25 minutes. Leave in the pan for 5 minutes after taking it out of the oven before moving them to a cooling rack. 1. Cream butter and add sugar mixing for 3-4 minutes until very well combined. 2. Add the vanilla and pinch of salt and combine. Finally add heavy cream to the mixture. Use immediately on cooled cupcakes or cover and refrigerate until ready to use. 1. Preheat oven to 350 degrees. Line a cupcake pan with foil and spray with non-stick cooking spray and set aside. 2. Mix together the crumbled Frosted Mini Wheats, coconut, brown sugar, and salt. 3. In a double boiler over the stove, melt together the butter and chocolate. Allow to cool slightly. 4. Pour chocolate mixture over the dry mixture and stir together with a fork. 5. Fill cupcake trays with the "nest" mixture pressing it into the bottom and the sides of each cupcake section. 6. Bake at 350 degrees for 10 minutes. Remove from oven and allow to cool. Then place pan in the fridge for nests to harden for at least 4 hours (or overnight) 6. Peel foil away from the nests, fill, and enjoy! Click HERE for more recipes from Our Southern Style! Have Some CRAZY FUN With Lalaloopsy! Spring break is coming up and that means my girls are gonna be home from school and looking for things to do! Hopefully the weather will be nice and we can venture outside, but as a Mom, I have to have a back up plan just in case. I love toys that help my girls develop their creativity and allow them to play together. I received the Lalaloopsy Girls Crazy Hair Doll (pictured above) at no cost to facilitate this review, and "Confetti Carnival" turned out to be just the thing to solve the problem of something to do inside, and also letting my girls work their creativity together! My almost-7-year old daughter loves this doll and couldn't wait to get her out of the box to see all of the fun things she could do with her hair. Each Lalaloopsy Girls Crazy Hair Doll comes with several strands of multi-colored hair extensions which was the first activity Eva was excited to try. The instructions describe that you can cut the dolls hair so that you can style it short and then add in the extensions so that you can also style it long. Eva just couldn't bring herself to cut her dolls hair, especially since she just came out of the box, but in a few weeks she might decide to give it a whirl. Some of the dolls hair is simply bright strands of yarn while other strands of hair has a waxy texture and very easily bends to attach the extensions (or even bend them to make fun hairpieces). Having two different textures of hair allows for Confetti Carnival to still keep her "Lalaloopsy look" but still leaves plenty of strands for lots of styling fun! The Lalaloopsy Girls Crazy Hair Doll can be styled over six different ways including cut, curl, lengthen, style, color, and glitter! I myself have some crazy curls and out of my four kids, Eva is probably the one who most looks like me, minus the curls. She loves to add some curls to her hair when she can and curls were just the way to go for her Lalaloopsy's first hair "do". I think my favorite thing, as a Mom, is that the Lalaloopsy Crazy Hair doll gives my girls something fun and creative do to inside TOGETHER! Mariyah is in her first year of middle school and Eva is just finishing 1st Grade. They are pretty far apart in age and pretty far apart in their interests. Mariyah loves fashion and would be content to do her hair for hours! Eva on the other hand loses interest pretty quickly but she adores her older sister and thinks she is just the "coolest". Her world is complete when her big sister spends time with her, and with her new Lalaloopsy Crazy Hair Doll, Mariyah has fun doing Eva's hair and playing "makeover" while Eva does the same with her own doll -they even have the "same" curling wand! This super fun doll is now super affordable! You can find Confetti Carnival and all of her Lalaloopsy Girlfriends at your local Target and Walmart, for around $19.95, but right now they are on sale at Toys R Us online for $15.99! Do you have a special girl in your life who loves Lalaloopsy Girls? Make sure to check out their website HERE for more Lalaloopsy fun! Follow Lalaloopsy Girls on social media to hear about all of their new dolls, promotions, and more! One lucky reader will win their own Lalaloopsy Girls Crazy Hair Doll! The giveaway will end April 17, 2015 at 11:59pm. Open to residents of the US only and must be 18 years old to enter. Enter using the Giveaway Tools entry form below. Disclosure: I was sent the items listed above at no cost to facilitate this review. Prize fulfillment is the responsibility of MGA Entertainment and not Our Southern Style or Thrifty Nifty Mommy. This giveaway is not associated with Facebook, Twitter, Instagram, or Pinterest.